Beryllium is a hard and light metal that has a high melting point and unique nuclear properties, which make it vital to numerous aerospace and military applications. Pure beryllium is an extremely light, strong and brittle metal. With a density of 1.85g/cm3, beryllium is the second lightest elemental metal, behind only lithium. The grey-colored metal is valued as an alloying element because of its high melting point, resistance to creep and shear, as well as its high tensile strength and flexural rigidity. Although only about one-quarter the weight of steel, beryllium is six times as strong. Like aluminum, beryllium metal forms an oxide layer on its surface that helps to resist corrosion. The metal is both non-magnetic and non-sparking—properties valued in the oil and gas field—and it has a high thermal conductivity over a range of temperatures and excellent heat dissipation properties. Beryllium's low x-ray absorption cross section and high neutron scattering cross section make it ideal for x-ray windows and as a neutron reflector and neutron moderator in nuclear applications. Although the element has a sweet taste, it is corrosive to tissue and inhalation can lead to a chronic, life-threatening allergic disease known as berylliosis. Although first isolated in the late 18th century, a pure metal form of beryllium was not produced until 1828. It would be another century before commercial applications for beryllium developed. The French chemist Louis-Nicholas Vauquelin initially named his newly discovered element 'glucinium' (from the Greek glykys for 'sweet') due to its taste. Friedrich Wohler, who was concurrently working on isolating the element in Germany, preferred the term beryllium and it was, ultimately, the International Union of Pure and Applied Chemistry that decided the term beryllium was to be used. While research into the metal's properties continued through the 20th century, it was not until the realization of beryllium's useful properties as an alloying agent in the early 20th century that commercial development of the metal began. Beryllium is extracted from two types of ores; beryl (Be3Al2(SiO3)6) and bertrandite (Be4Si2O7(OH)2). While Beryl generally has a higher beryllium content (three to five percent by weight), it is more difficult to refine than bertrandite, which on average contains less than 1.5 percent beryllium. The refining processes of both ores, however, are similar and can be carried out in a single facility. Because of its added hardness, beryl ore must first be pretreated by melting in an electric arc furnace. The molten material is then plunged into water, producing a fine powder referred to as 'frit'. Crushed bertrandite ore and frit are first treated with sulfuric acid, which dissolves beryllium and other metals present, resulting in a water-soluble sulfate. The beryllium-containing sulfate solution is diluted with water and fed into tanks that contain hydrophobic organic chemicals. While beryllium attaches to the organic material, the water-based solution retains iron, aluminum, and other impurities. This solvent extraction process can be repeated until the desired beryllium content is concentrated in the solution. The beryllium concentrate is next treated with ammonium carbonate and heated, thereby precipitating beryllium hydroxide (BeOH2). High purity beryllium hydroxide is the input material for major applications of the element, including copper beryllium alloys, beryllia ceramics, and pure beryllium metal manufacturing. In order to produce high-purity beryllium metal, the hydroxide form is dissolved in ammonium bifluoride and heated to above 1652°F (900°C), creating a molten beryllium fluoride. After being cast into molds, the beryllium fluoride is mixed with molten magnesium in crucibles and heated. This allows pure beryllium to separate from the slag (waste material). After separated from the magnesium slag, beryllium spheres that measure about 97 percent pure remain. Excess magnesium is burned off by further treatment in a vacuum furnace, leaving beryllium that is up to 99.99 percent pure. The beryllium spheres are normally converted to powder via isostatic pressing, creating a powder that can be used in the production of beryllium-aluminum alloys or pure beryllium metal shields. Beryllium can also be readily recycled from scrap alloys. However, the quantity of recycled materials is variable and limited due to its use in dispersive technologies, such as electronics. The beryllium present in copper-beryllium alloys used in electronics are difficult to collect and when collected are first sent for copper recycling, which dilutes the beryllium content to an uneconomical amount. Due to the strategic nature of the metal, accurate production figures for beryllium are difficult to attain. However, global production of refined beryllium materials is estimated to be roughly 500 metric tonnes. Mining and refining of beryllium in the US, which accounts for as much as 90 percent of global production, is dominated by Materion Corp. Formerly known as Brush Wellman Inc., the company operates the Spor Mountain bertrandite mine in Utah and is the world's largest producer and refiner of beryllium metal. While beryllium is only refined in the US, Kazakhstan, and China, beryl is mined in a number of countries, including China, Mozambique, Nigeria, and Brazil. Walsh, Kenneth A. Beryllium Chemistry and Processing. ASM Intl (2009). US Geological Survey. Brian W. Jaskula. Beryllium Science & Technology Association. 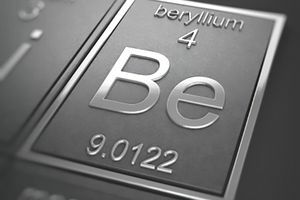 About Beryllium. Vulcan, Tom. Beryllium Basics: Building On Strength As A Critical & Strategic Metal. Minerals Yearbook 2011. Beryllium.